Boil 2 cups of water in a small sauce pan. 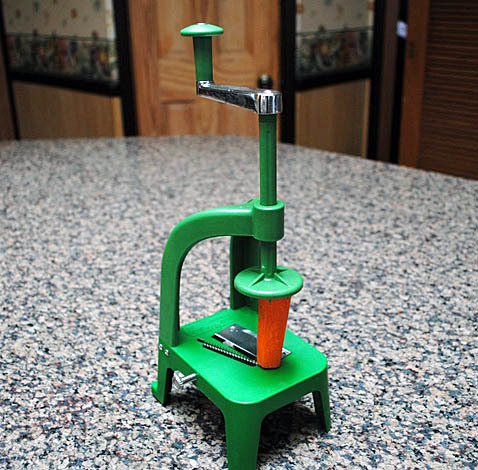 Drain the chickpeas from the can, and drop them in the boiling water for 5-10 second. Quickly drain them and rinse with plenty of cold water. Reserve until cold. 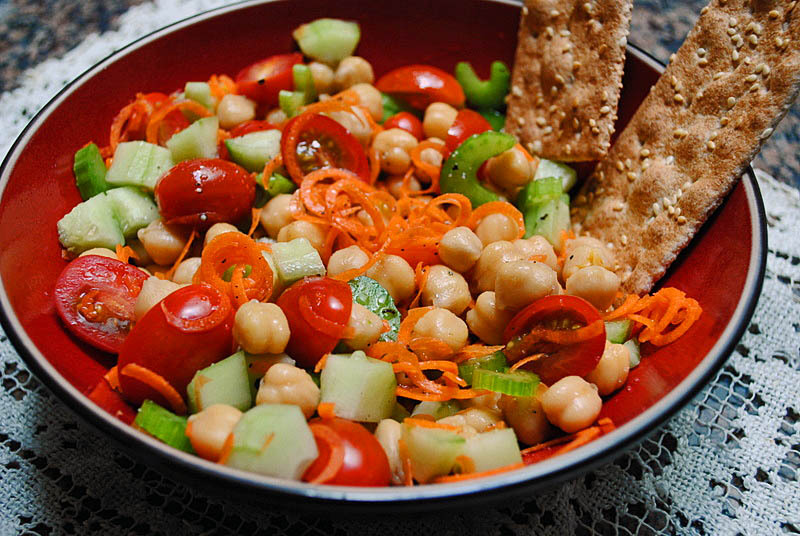 In a bowl, mix all the ingredients from chickpeas to tomatoes. Make a simple dressing with oil, a squeeze of lime juice, a little balsamic vinegar, salt and pepper. Drizzle over the salad and…. 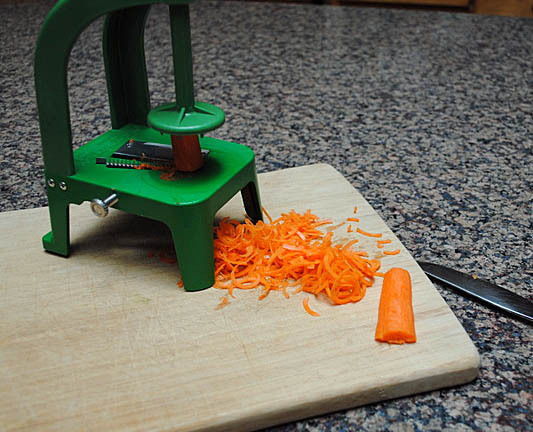 I like raw carrots in salad, but prefer if they are cut paper-thin. This gadget gave me the exact texture I was hoping for. The very thin ribbons get perfectly seasoned and retain just a little crunch. Chickpeas & boiling water: this is a tip I learned from Barbara Tropp, in her book Mastering the Art of Chinese Cooking. She recommended to rinse all sorts of canned products in boiling water, to remove what she described as the “tin taste”. The improvement in flavor is quite noticeable. So I normally do it whenever I use chickpeas, beans, and water chestnuts. 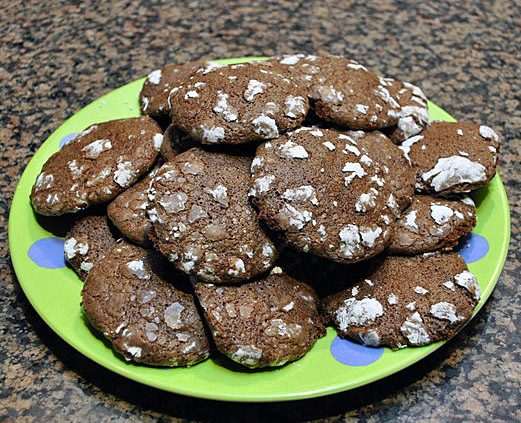 SECRET RECIPE CLUB: EARTHQUAKE COOKIES! After one month break, we are back with “The Secret Recipe Club“, and our group even has a new moderator, April, who did a great job coaching us through the changes that took place during the break. For those who are not familiar with the event, a few weeks before reveal day, each member is assigned a food blog (in secret) to cook a recipe from. This time I was paired with My Judy the Foodie. When I get an assignment, I jump straight to the “About” page, to get to know my fellow blogger. Shari describes herself as a “kitchen-clueless person”. But one who is ready for a challenge, the challenge of creating new traditions for her own family, inspired by her mother’s cooking. The whole blog is in fact a beautiful tribute to her Mom. Her page “About Judy” was particularly touching to read. 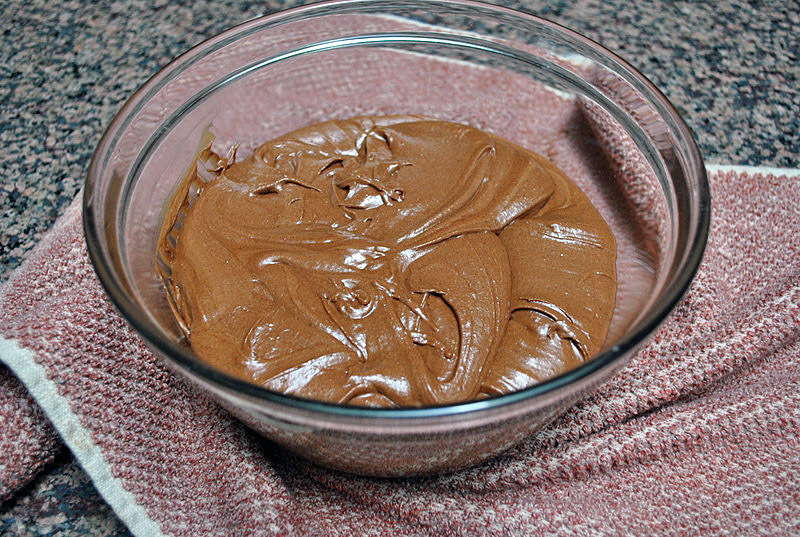 Melt chocolate and butter in a microwave safe container, stirring every 15 seconds. Beat the eggs in a large bowl, add the sugar, vanilla extract, and melted chocolate/butter mixture. Add the baking powder, flour, and salt and beat until very smooth. Place bowl in fridge and chill as long as 24 hours. Heat the oven to 350 F. Cover two cookie sheets with parchment paper. 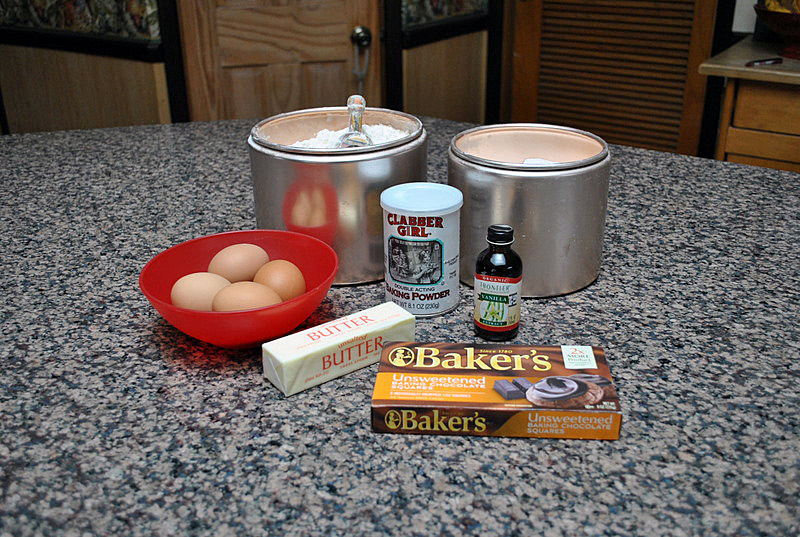 Place confectioner’s sugar in bowl large enough to roll out the fudge balls. Take a teaspoon of the cookie dough and form into balls. 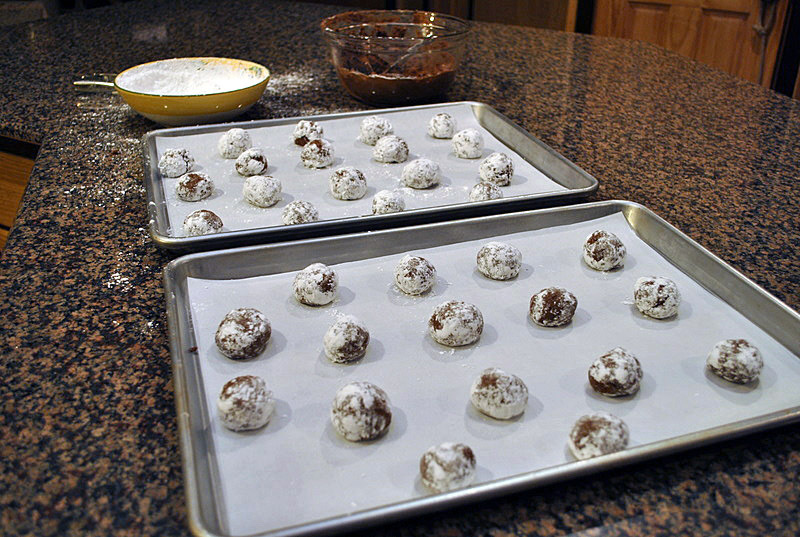 Coat the ball with confectioner’s sugar by rolling it around in the sugar many times. Place on baking sheet with enough room for each ball to “explode” open. Bake for approximately 12 minutes (mine took longer). Cool and then remove cookies to wire rack (make sure to place foil under the rack as powdered sugar can be quite messy). Comments: When you make these cookies, don’t forget the cookie dough must sit in the fridge for 24 hours. 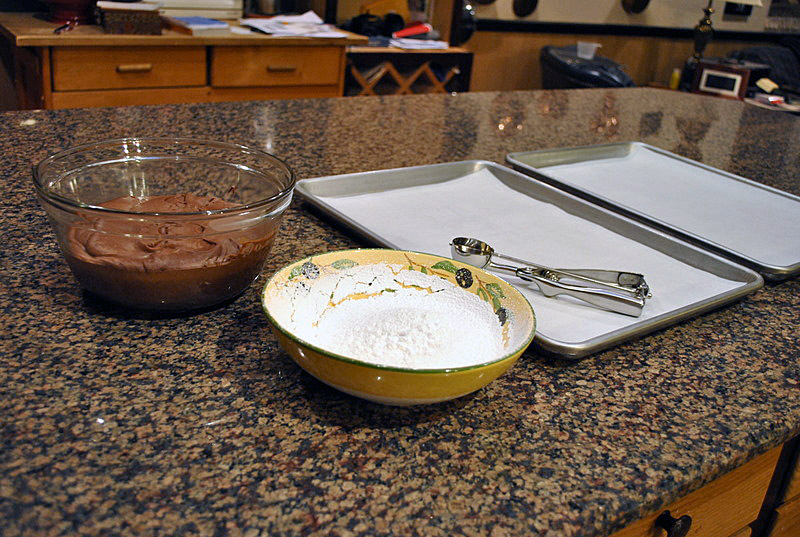 Once you mix the dough, it will be very soft, the only way you can shape them is by refrigerating for several hours. As far as taste goes, a full day in the fridge seems to be the best option. My cookies did not explode the same way Shari’s did, her cookies looked a lot more “interesting” than mine. Not sure what happened, I suspect the geologic fault that runs near our home was fast asleep when I put them in the oven. Bummer! However, exploded or not, these cookies were VERY tasty. They have a slightly fudgy consistency, and as they melt in your mouth the chocolate flavor will force you to close your eyes and indulge in extremely happy thoughts. My kind of cookie!